This is the 2nd square of the 30 square Knitterati Afghan. The afghan commemorates Cascade Yarns® 30th anniversary. The 30 squares will be released throughout 2017 as part of the mystery knit-along. 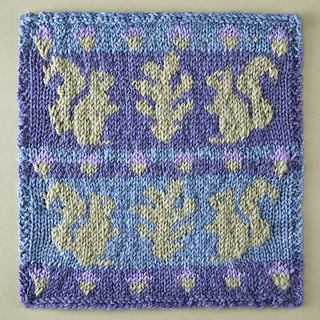 Knit-in squirrel motifs decorate the wide bands of stockinette stitch, with colorful acorns in between. (This will keep your gauge more consistent).